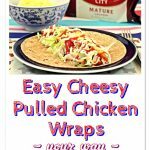 Easy Cheesy Pulled Chicken Wraps - your way! 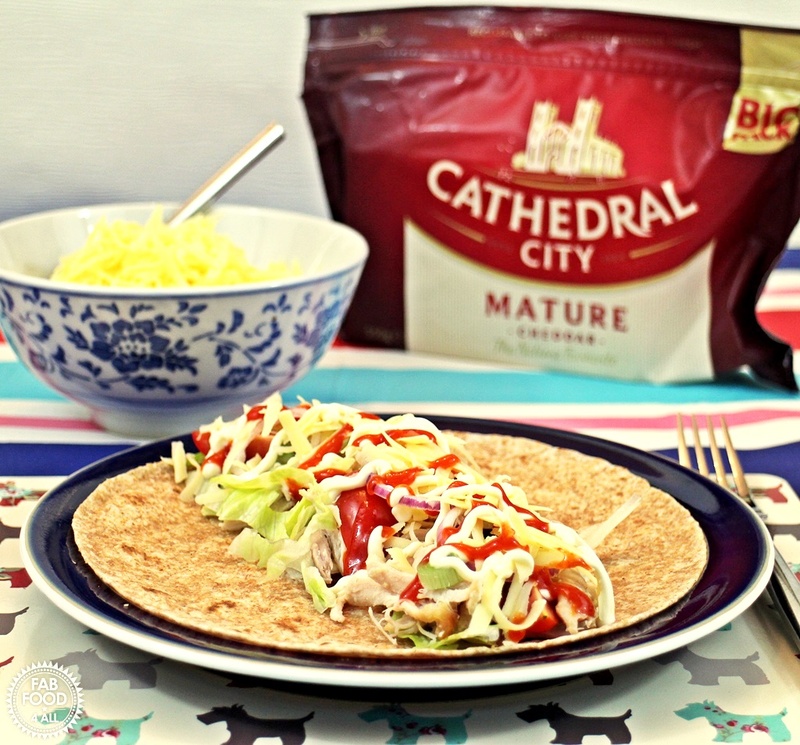 These Easy Cheesy Pulled Chicken Wraps made with Cathedral City Mature Cheddar, slow cooked pulled chicken thighs and your favourite sauces are so quick and easy to prepare, your family will love them! Bubbling cheese must on no account be allowed to go unwitnessed. The bit of cheese that’s too awkward to grate must immediately be eaten. Crispy bits are irresistible, absolutely no effort should be made to resist them. You might feel guilty after multiple visits to the cheese board. Do not. If you burn yourself on melted cheese, you will make a big fuss about it. Which of these rules can you relate to? In our house I have to admit to nibbling on the spare bit of cheese that won’t grate for fear of losing my fingers. However I usually have competition in the form of my cat Coco who knows not only the smell of cheese but no-one can say the word without her turning up in the kitchen! It’s got so bad I find myself spelling it out rather than saying it these days. When the kids are making their packed lunches with Cathedral City Mature Cheddar Slices Coco will wind herself around their legs hoping for a morsel! According to Cathedral City’s reseach 21% of us would forego social media in favour of cheese, such is our love for it. Plus 66% of us will have cheese in our fridge at any one time – I don’t think you’ll ever find our fridge without it! We love finely grated Extra Mature Cathedral City sprinkled onto our spaghetti bolognaise and ratatouille (yes my family now prefer it to Parmesan) and the Mature Cheddar is constantly used in sauces for pies, scattered over omelettes before grilling and of course cheese toasties etc! Whether you prefer your Cheddar in a block, grated, sliced or spreadable the Cathedral City range has it covered. So if you “love cheese, welcome to the club” and why not check out the Cathedral City Facebook page! 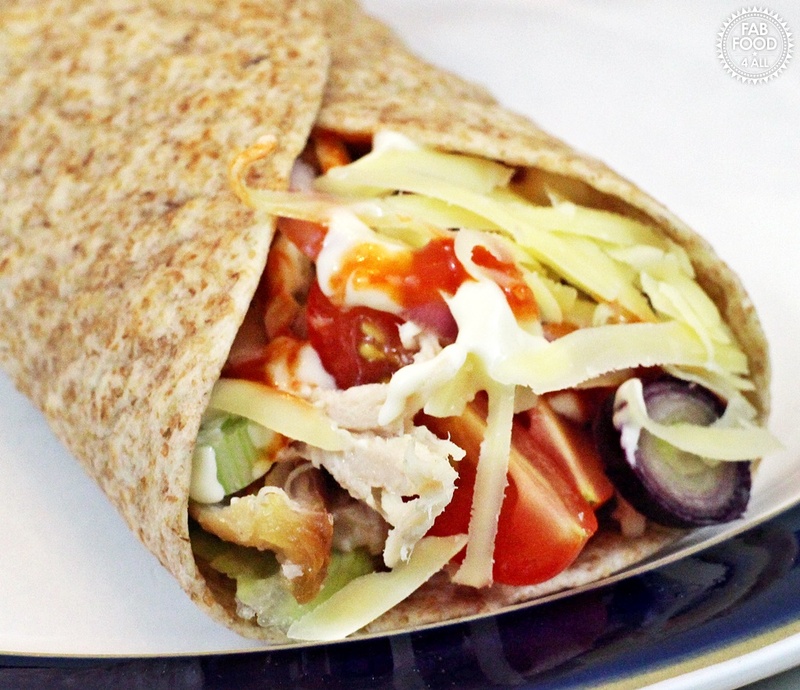 So back to my recipe, Easy Cheesy Pulled Chicken Wraps is a dish I make on days when I know I am just too busy to cook. 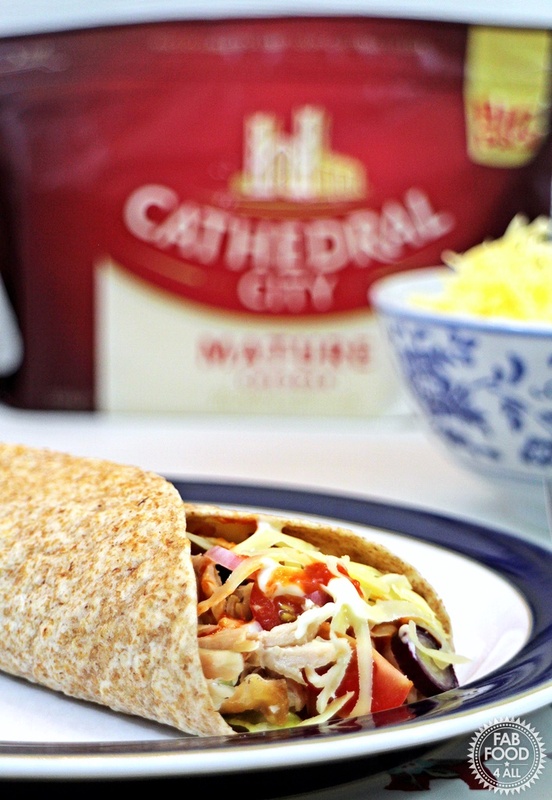 I simply tip a pack of chicken thighs into my slow cooker, switch it on and 6 hrs later I have juicy succulent chicken which I pull and serve at the table with tortilla wraps, salad, grated Cathedral City Mature Cheddar and sauces so that the family can have their wraps just how they like them! I have to say it’s usually a combination of Scriracha and mayonnaise for me! 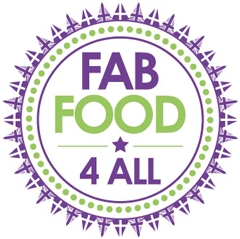 This is a great fuss free summer meal and I do hope you try it! You could also use for picnics or packed lunches. Place the chicken thighs into a slow cooker and cook on low for 6 hrs or high for 4 hours (or until cooked through). No need to add anything! Put all the prepared salad items and cheese in serving bowls. Once the chicken has cooked, remove from the slow cooker and pull apart the thigh meat discarding the skin and bones. Place in a serving bowl. Warm the wraps according to their instructions (I usually microwave for 40 seconds). 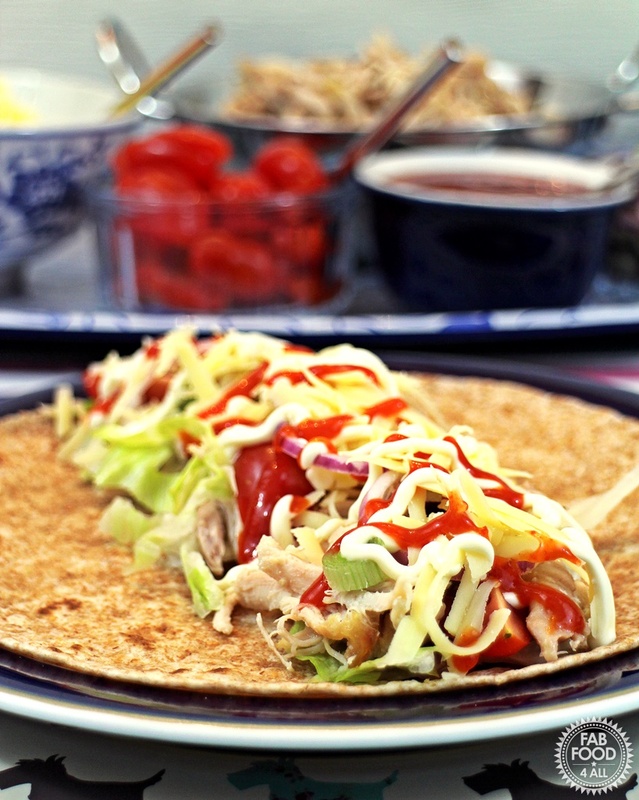 Place all the salads items, grated Cathedral City Mature Cheddar, pulled chicken thighs and tortilla wraps on the table and allow your diners to build their own Cheesy Pulled Chicken Wraps. NB: This is a commissioned post for Cathedral City, all opinions are those of myself and my cat Coco! Love tortillas, but never tried a chicken one oddly enough! Lovely suggestion! They look amazing, love the cheese on chicken idea! We have wraps quite often! 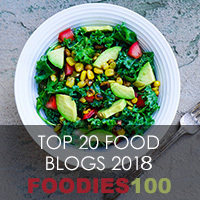 Great idea to use chicken thighs, we never thought of that one! Wow these look amazing, my kids would love this, they can never have enough cheese!